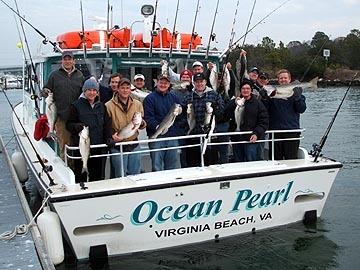 Fishing is one the most enjoyable ways to spend your visit to Virginia Beach. Booking a trip on the Ocean Pearl is a good choice. Whether you are an expert, novice, fly or light tackle fisherman, Capt. Steve Wray can accommodate your needs. All fishing licenses, bait and tackle are provided. $200 per day deposit required. Trips do not include gratuity for mate. to your request. It’s easy. Bring a long sleeve shirt or sweatshirt and rain gear. Some mornings can be cool. In winter, dress in layers. Bring a hat and sunglasses. Polarized sunglasses are preferred. They reduce the surface glare on the water. Protect your lunch from water. Ziploc bags will do the trick. These can also be used for cameras, wallet, etc. Please wear non skid, non marking soled shoes. We ask that you please leave all glass containers at home. Bring a cooler to transport you fish home.